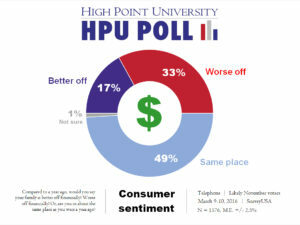 HIGH POINT, N.C., March 14, 2016 – The High Point University Poll finds that more North Carolina voters identify the economy (21 percent) as the most important problem facing the U.S. and education (21 percent) as the most important problem facing the state. 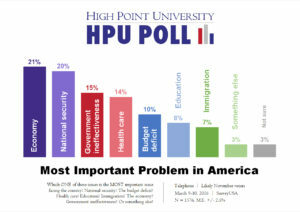 At the national level, other concerns were national security (20 percent), government ineffectiveness (15 percent) and health care (14 percent). 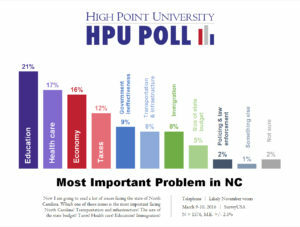 In North Carolina, the other top issues included health care (17 percent), the economy (16 percent) and taxes (12 percent). When asked how their family is financially now compared to year ago, 49 percent say they are in the same place, 33 percent say they are worse off and 17 percent say they are better off.